Oh yeah, I'm back in for this. Fanfest was awesome, just fyi. If you're in England, go next year. Mat has started an wont be up for 25 hours, I hear there are hundreds of players logged out in front of the rouge area to be first to get it, thats kind of pathetic. It's a bit sad they're going straight for Rogue. My suggestion is to wait until after you've unlocked all the new stuff and done them first. Because Expert Roulette and Trial Roulette are both locked until you do the new ones, meaning you have to go through the main story (unlocks 1 dungeon and 1 trial) and the Hildebrand questline (unlocks 1 trial) if you want them re-unlocked for easy farming of the new Tomes of Poetics coming out. Got the day off tomorrow so I'll actually be around for once, yay! Just in case anyone not currently active isn't aware, there is a Free Login Weekend this weekend. Note: This is not from my point of view. I only just began learning T9 yesterday with a number of more experienced members of my FC. Though I have yet to find a group to join for completing T7 and T8, the FC wanted me to push onward and work with them towards completing second coil. Meanwhile, Ninja is fun and I can't believe how SE has managed once again to one-up previous installments of the Hildibrand storyline. One of these days i'll actually get round to doing turn 5, ha. Only logged in for about 30 minutes, but it was enough to convince me to return for a bit once I finish a review game or two. Unlocked Rogue and got it to 5 just to test it out. Got some nice gear from Aira and Lucas as well as my Fat Chocobo. Life in Eorzea is going to be good again soon. Bah, I've come to the realisation that I'm becoming bored with FF14 again. I unsubbed in preparation for Dragon Age inquisition, but just as well. I've grazed all the content I liked and off I go again! I especially enjoyed the atama and animus relic weapon grind but the Nexus defeats me. House/Flat decorating, Raiding, PvP, Chocobo rearing, crafting, doesn't do it as much for me. I still want to get all the poetics gear but I've learned that there's no shame in taking a break, it feels so fresh when I return. Having said that, I discovered my DVD ROM Rewriter drive is knackered, Kaput-ski so now I have to wait for one to be delivered and installed before I can play Dragon Age Inquisition goodness. (1) By completing a dungeon, there is a small chance that you will obtain the associated item. Well, just pulled the trigger. I'm a level 16 CNJ right now, going to aim for whm :) See you on Excal if you're there! You're stronger than I Chicken, I've given up on the Relic. The second they added desynth as a requirement, it became a no-go for me. You need 2-6 mil per piece if you want to buy the pieces themselves for the quests, and the crafters on this server like to charge 500k per desynth attempt for the items. I'm not made of money, the most I've ever held is 1 mil, which went into the FC when we wanted a bigger house. I will not be completing this relic quest, and it's put a damper on me even wanting to continue playing the game. I love FF14 but not enough to grind for the relic quest past the animus books bit. I agree with you DarkRPGmaster but I don't think you should let it ruin your enjoyment of the game. For gearing, the latest armour poetics armour set and various other weapon options are pretty adequate for any but the toughest content. Chickengod, that is one sadistic joke haha, but congrats on your weapon. I'm just speculating, but perhaps there is a seed of truth to the rumour and what they plan is on a quest to change your precious relic weapon into a pretty effective materia for the next series of awesome relic weapons to go with the higher level cap etc in Heavensward update. I am almost certain that there will be another weapon option in the that update for casual players ot get excited about, because that would be a sensible move. But I salute and support the people who actively do the rest of the Relic weapon quest. But I choose what's right for me, and that's use the time to do stuff I enjoy more. I have bought the Shadow of Mordor plus dlc presently on steam sale for PC woot! But as usual, I will not play immeditely (hehe). Okay, I've unlocked whm. Haven't really used it yet; folks in the CTY FC are really helpful and have been helping me with gear. Managed to get the Zodiac after a week of trying since the prices of all the HQ desynth items dropped to manageable levels on Exodus (about 200-400K). So now me and my friend Sneering Blaze now have the Zodiac weapons, and a tear was shed at the FF theme playing while it was given to us. But sadly, the Zodiac weapons, at least the MNK and WHM ones anyway, are ugly as hell. Here's a pic of us with them. 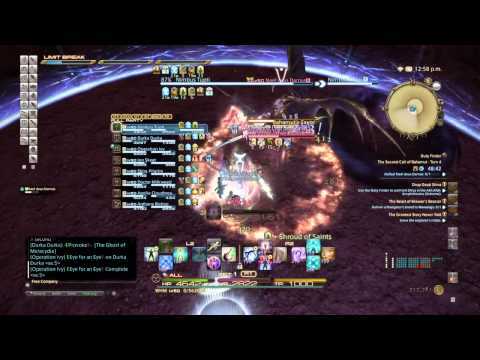 Yesterday- 11th January I finally downed the Garuda Extreme primal encounter with the rest of RA guild on Leviathan. Was so chuffed! I'm a terrible slacker , far from the raiding crowd, but the guild really exerts no pressure on me. Thanks to Jammy Dodger for his really clear explanation of the mechanics and the rest of the raid team for patiently waiting for me to fight against my denser moments and claw my way to victory(by not dying so much). But Twintania and the "Dive" mechanic and figuring how to time the AOE avoid I am still not getting it but also too scared to try. Right on Sev, I have Bahamut on the brain because I recently watched a very mediocre anime named Rage of the Bahamut, Genesis. I checked further and found it was based on a social card game -,-; thanks for the save. I've managed to max out all the gathering classes and all the crafting classes are over level 30. Culinarian and Goldsmith are maxed, and I'm working on maxing out Leatherworker next. It's quite nice being able to repair my own equipment anywhere, and Goldsmith lets me do that to my accessories, meaning there shall never be a time when they break if I can help it.